Perama is located on the south side of Corfu, just across the Mouse Island (Pontikonissi), 7 km from Corfu town. Here you'll also find the so-called Kaiser's Bridge, which connected the pier with the road to the Achilleon, when the German royal family resided on the island. The bridge was built by the last private owner of the Achilleion Palace, the German royal family of the early 20th century. It was exploded during the German occupation, so that military vehicles could pass underneath. The area covers an area of 5 km, starting from Chrisida and the Karydies area, 5 km away from Corfu Town. It ends at the Kaiser Bridge, 2 km from the village of Benitses. 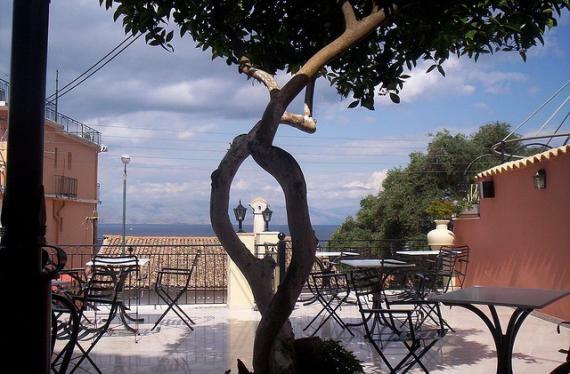 It is a popular tourist resort surrounded by olive trees and pebble beaches. Find information about selected Hotels, apartments and rooms in Perama to choose the perfect place for your accommodation.